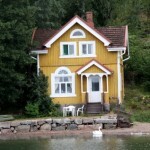 Stentorp is surrounded by unique and rich nature, situated about 20 km from Turku, in the Pargas archipelago region. You can visit us either by car or by boat. 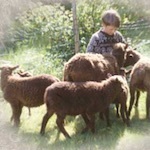 At the farm, we breed Finnish landrace, Finnsheep. 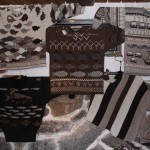 I, together with skilled local knitters, design and make knitwear from the Stentorp Finewool. The skins are made into fur vests, muffs and other products. Our goal is to get fine, soft, curly and lustrous wool, which is a result of targeted wool evaluation of the lambs. All the products are handmade, measure-made if needed. You can see influences of other cultures knitting traditions and my love for our extraordinary archipelago in my design patterns. Our sheep are grazing on uninhabited islands nearby. They drink sea water and eat versatile food. There are always some sheep pasturing around Stentrorp, for the visitors to caress and for the sheepdog shows. THE CRAFT EXHIBITON/ FARMSHOP is open daily between 12 and 18 o’clock during the Summer season, during other times upon agreement. Welcome to explore our products or caress the sheep.